Peter Daniels sees Floyd Skloot’s new collection as a meditation on life and death – and on poetry as a means of dealing with both of them. Eyewear is establishing itself as a transatlantic press, publishing poets from both sides, which should be able to improve the profile of some of these Americans over here. 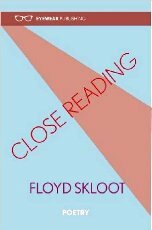 Floyd Skloot is definitely one who should be better known if only for this 2014 book, but I would like to read his back catalogue too. where his kind cannot live? – while Robert Louis Stevenson is more present in his place in Samoa, savoring the heavy scent / of early September sea air until thoughts of writing about Scotland and its winds send a chill through him and he knows he will be unable to work again. The work of creating in words, music or paint is what these poems are about at least as much as the approach of death, and they set the tone for the whole book, in which Skloot’s life and work as a poet is under his own scrutiny, from the perspective of some need to consider not that his days or his career are over, but that they will be. Accordingly he considers what has made his life what it is, rather as he describes Robert Frost: So now he knows the heart remembers loss / the way the woods remember winter storms. – and even the poem for his daughter on her 35th birthday is called ‘Almost Equinox’, which is not only for the date she was born, but somewhat unsparingly stating this as the midpoint of her life too. on the floor like a couplet when he sat. Section IV, ‘Vertigo’ contains some of the best poetry about illness since Gunn’s Man with Night Sweats, starting with two third-person poems about a man’s recovery from cancer and dealing with US health insurance, then one ‘The Lost Hour’ about a blackout in hospital – time / could be catching up to me – a man / of sixty but they all say I’m / safe for now, should rise again when I can. However, the rising isn’t so easy when the onset of vertigo plays havoc with a person’s relationship with the world, and five poems cover the six month ordeal of it – I would stand if I could get a grip on / something more solid than undulating air – and yet humour is available despite it all. of colour that means the world still turns. of light. It leads us back toward home. The last poem, ‘Closing in July’, is like Hardy on impermanence if he had written an unrhymed villanelle which even villanelle-haters should like. Perhaps you have to be over sixty to write this kind of poetry, but I hope you don’t have to be one of us over-sixties to enjoy it (and it took me a few reads to appreciate the subtleties). This is a tremendous book.